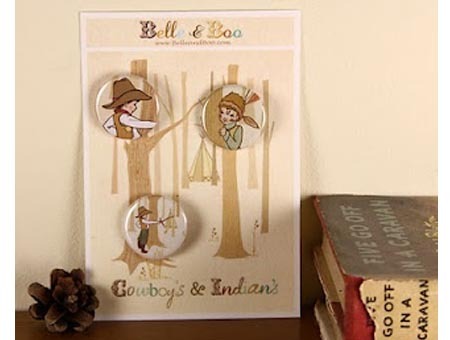 Three badges featuring elements from Belle & Boo's original illustration 'Cowboys & Indians'. The badges are 1.25" in diameter and have a pin closure. The badges are pinned to a beautifully printed display card, approx 4" by 6", this makes them perfect for party bags, prizes or gifts. They make a lovely alternative to a traditional greeting card. The cellophane bag they arrive in has a 'To.... & From....' sticker on the back, so you can add a personal message. 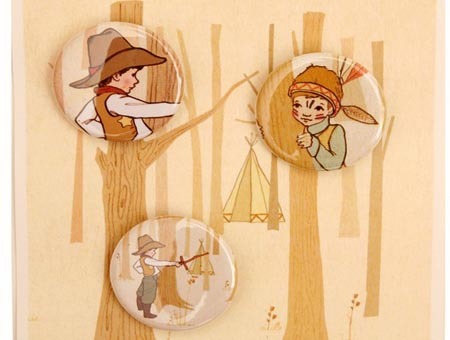 We have other Belle and Boo badges; Muddy Morning, Belle Hugs Boo and Belle and the Chick. Click here to see them all.